Marseille is France’s oldest and second largest city. It’s located on the Côte d’Azur of France and is one of the Mediterranean’s premier ports. The city boasts connections with Italy, Spain and the African contintent which makes it an important industrial and economical city. Larger cruise ships in Marseille anchor north of the city at Môle Leon Gourret, the industrial area of the port. Smaller vessels of luxury cruise lines such as Seabourn and Silversea can dock closer to town at the Place de la Joliette. Marseille is situated on the South Eastern coast of France. Larger vessels dock north of the city at Môle Leon Gourret, which is the industrial area of the port. Smaller cruise ships tie up at the Place de la Joliette, closer to the city centre. Companies operating from the Port of Marseille include MSC Cruises, Norwegian Cruise Line, , Costa and Croisières de France. Marseille is also a primary ferry port for ferries crossing to Corsica, Sardinia, Algeria and Tunisia. Ferries are operated by various companies and there’s a choice of ferry crossings daily. The terminal can easily be reached by car via the A7 and A55 motorways. The port is linked to the SNCF Rail network by Place de la Joliette Metro station. 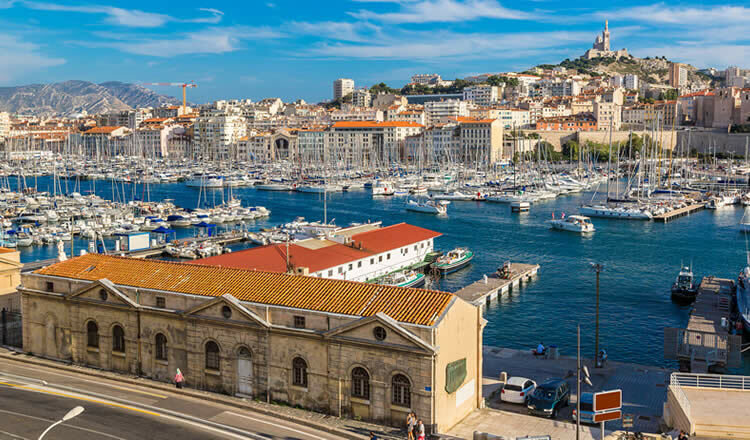 We have a choice of over 350 Marseille hotels, so don’t worry about accommodation. Choose between affordable and moderate hotels, self catering apartments, budget hostels and charming bed and breakfasts and enjoy your perfect cruise holiday. Located within walking distance of the Vieux Port (Old Port), tram and metro. Seaside accommodation close to the beach, located just outside the city centre. 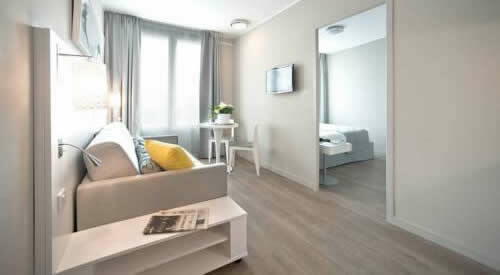 Studios and apartments within easy reach of Marseille city centre. Budget friendly property. The city is located on the Mediterranean Sea in the Provence-Alpes-Côte d’Azur region. Marseille is home to numerous museums, opera houses and theatres. Browse through the Old Port’s narrow streets over cobbled squares and see colorful fishing boats sail pass the historic Fort Saint-Jean. Above the hilltop overlooking the Mediterranean Sea and city is the famous Basilica Notre-Dame-de-la-Garde. Visit the old Cathedral of la Major, built on the ruins of a temple of Diana or the Cathédrale Sainte-Marie-Majeure de Marseille, dating back from the 19th century and built in Byzantine-Romanesque style. L’hôtel de ville de Marseille at the Quai du Port is the city hall of Marseille. It’s a beautiful example of the civil architecture of the end of the 17th century. The port area boasts excellent restaurants with lovely outside terraces. Don’t forget to try the world famous dish “bouillabaisse” with six different types of fish. In the morning stroll around the fish market on the Quai des Belges at the Vieux Port. A nice day trip out of Marseille is the Island of Chateau d’If, just a short boat ride away from the Vieux Port. It’s a fortress built by François I and made famous by Alexandre Dumas’ classic 1840s’ novel Le Comte de Monte Cristo (The Count of Monte Cristo). Beyond the city lies the beautiful Provence region. Discover the lovely villages of Arles, St. Remy-de-Provence, Avignon and Aix-en-Provence. Various cruiselines depart Mediterranean voyages from the Port of Marseille in France. Popular ports of call include the port of Rome, which is Civitavecchia, Bastia in Corsica, Palma de Mallorca, Livorno (Pisa, Florence) and Valencia in Spain. Some longer itineraries bring ships to the Canary Islands (Tenerife, Grand Canaria), the river port of Lisbon and even La Romana in the Dominican Republic. The city is served by Marseille Provence Airport or Aéroport de Marseille Provence, which is located just over 15 miles or 25 km from the center of the city (about 30 minutes by car or taxi). You can get to/from your city centre hotel to the airport by taxi or public transportation (train or bus). Trains depart from Vitrolles Aéroport Marseille Provence Station. A free Airport Train shuttle bus connects the airport (Platform Airport Train, in front of Hall 1) and the railway station. The Navette Marseille Aeroport bus service connects the airport with Marseille Gare St Charles (main central train station). The French currency is the Euro. The main language in Marseille is French. The local dialect is Provencal. As being a city of a huge foreign population, you can also expect to hear Spanish, Italian, English and some Arabic languages as well.